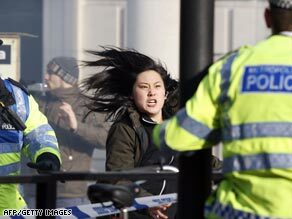 Protesters carrying Tibetan flags chanted "China Murderers"
LONDON, England (CNN) -- Pro-Tibet activists jumped security barriers and scuffled with police outside the Chinese embassy in London Sunday as hundreds of demonstrators gathered to protest a visit by Chinese Premier Wen Jiabao. Protesters carrying Tibetan flags chanted "China Murderers," and "China Out of Tibet," as Wen, on a three day trip to Britain, arrived at the embassy. China has long been criticized by the international community for its human rights record in Tibet. Tibetans are pushing for autonomy from China and greater religious freedom. Wen was greeted at the embassy by a firecracker display in honor of the Chinese New Year before being escorted inside by security personnel. A group of protesters attempted to jump over security blockades when Wen's motorcade arrived at the embassy. Several were wrestled to the ground by police and arrested. Police said five people were detained, according to the UK's Press Association. Wen is due to meet British opposition party leaders on Sunday before sitting down with Prime Minister Gordon Brown on Monday. Brown was among a number of international leaders who skipped the opening ceremonies of the 2008 Olympic Games in Beijing, amid an intense campaign from human rights groups opposed to China's international policies and human rights record.